The University District, home of University of Washington, is often called "a city within a city". It is a neighborhood of Seattle, northeast of downtown on Portage Bay and Lake Washington. Naturally, the community has a lot of college-age residents and a trendy music and nightlife scene, but it has plenty of amenities appealing to all age groups. The U-Village shopping district has plenty of restaurants and bars, a farmers market, and street fairs. Homes for sale in University District include single family residences and condos of mixed construction and age. 8 Beds | 2.25 Baths | 2070 sq. Ft.
2 Beds | 1.75 Baths | 1120 sq. Ft.
2 Beds | 2 Baths | 1442 sq. Ft.
1 Beds | 1 Baths | 685 sq. Ft.
2 Beds | 1.75 Baths | 1215 sq. Ft.
| 1 Baths | 362 sq. Ft.
| 1 Baths | 500 sq. Ft.
5 Beds | 2.5 Baths | 3170 sq. Ft.
Blue Summit Realty has the most accurate and up to date University District real estate listings on the web. Currently there are 2 homes for sale, 6 condos for sale, and 1 vacant land properties in University District. Of the 9 total University District residential listings for sale 0 are bank owned, 0 are short sales, 0 are new construction, and 0 are townhomes. The price ranges from $185,300 to $0 with a median list price of $697,156 and median sold price of $559,450. Make sure to refine your University District real estate search by property type, price, square footage, bedrooms, bathrooms and more with the search tool above or view the University District listings on our interactive map. 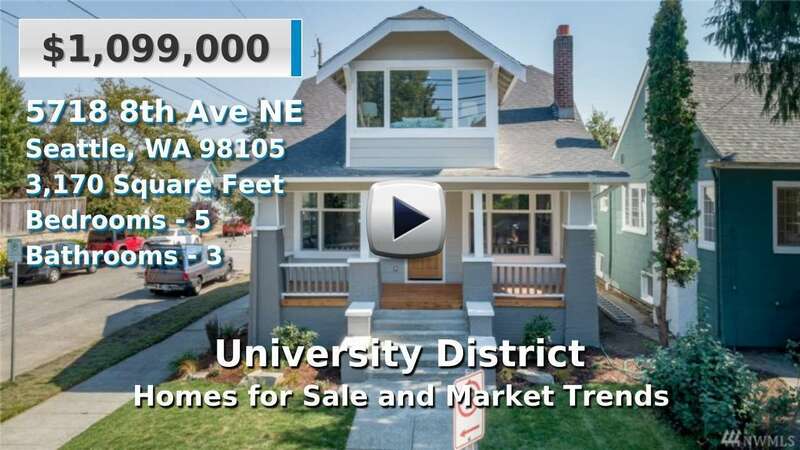 Our University District real estate listings were updated 25 minutes ago.